Smith & Wesson has turned its M&P line into an entire brand of its own. Of course, there are the familiar M&P handguns, which started way back in 1899 with the .38 Military & Police double-action revolver and now includes several semiautomatic pistols and AR-style rifles and carbines, but now the brand also includes all sorts of gear. There are M&P gun cases, cleaning kits, shooting glasses, shooting mats, and knives. And there are also several M&P flashlights. 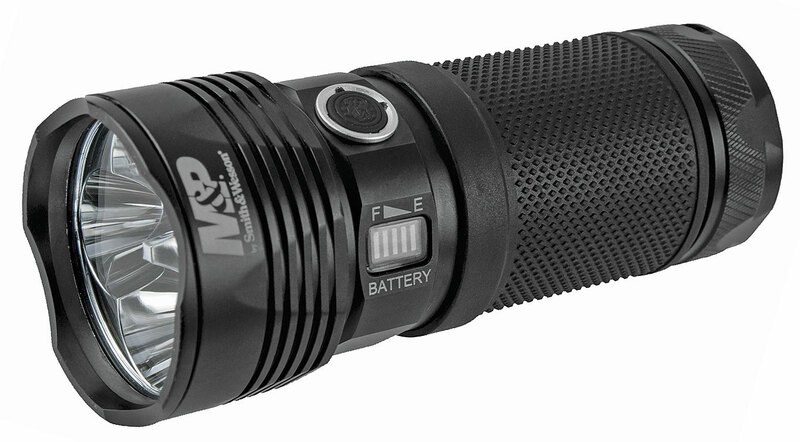 The new M&P rechargeable flashlights feature top-of-the-line CREE LED lights, and they deliver from 1,045 lumens up to 10,000 lumens depending on the model. All M&P rechargeable flashlights use a rechargeable battery and USB to Micro USB charging cord to quickly recharge at home or on the go. The flashlights feature a crenulated head and are constructed from anodized aerospace aluminum. They are built to stand up to the elements and are impact- and water-resistant. The Duty Series FS RXP 4x18650 light puts out 10,000 lumens (estimated) on high and is tripod mountable. It has a digital on/off switch with lock-out feature. The Duty Series FS RXP 2x18650 puts out 3,100 lumens on high. It is also tripod mountable and has a textured rubber grip and digital on/off switch with lock-out feature. The Duty Series MS RXP 1x18650 Battery Bank produces 1,045 lumens on high and has an internal 3,400mAh battery bank to charge cell phones, lights, and other portable accessories. The Duty Series CS RXP 1x18650 produces 1,045 lumens on high and features low, low-medium, medium-high, high, and strobe functions. The Delta Force MS RXP 1x18650 Flashlight puts out 1,050 lumens on high and has low, high, strobe, and momentary-on functions.